Creating a strong culture in which every member of our crew embodies the habits of character is an ultimate goal for our school. What do we do when a member of our crew isn’t using the habits of character? What do we do when a member of our crew is causing harm? Our responses to these off-culture behaviors are grounded in restorative practices. Our aim is to respond to the off-culture behaviors in a way that builds community, fixes the harm that was done, helps students learn from their mistakes and empower students with the skills to resolve conflicts. Every morning and afternoon we circle up. This is part of our intentional community building. Our morning crew starts with a greeting, followed by a share, and lastly an initiative. The greeting is a way to say good morning to the crew. This could be a one minute greeting-- where each member of the crew greets each other with a handshake, a high five or a hug for one. Next up would be a share. Often times shares are grounded in our habits of character [link to blog post outlining the habits of character]. We will turn and talk or share out to the whole group about certain topics. Lastly is the initiative. Initiatives are team games designed to create teachable moments surrounding our habits of character. In the afternoon, we circle back up for announcements and appreciations. The idea behind these circles are intentionally building community and teaching social-emotional skills. This is preventative work and is truly a foundation of our school. Harm Was Done: Now What? Inevitably students will have some actions that are not aligned with our culture. Members of our crew will hurt other members. Harm will be done. So, how do we respond when harm is done? When students have conflict we bring them together to fix the harm that has been done. Who was affected by your actions? What can you do to make things right? What should happen to make things right? Guiding the students through this restorative practice allows them to be a part of the solution, feel heard and take ownership over the school culture. Another avenue to empower students is a peace path. This is a process that can be taught to students. After a few rounds of the peace path students should be able to walk the path by themselves! Student A: I feel _________ when you _________ . Student B: I know you feel _________ when I _________ . Student B: I feel _________ when you _________ . Student A: I know you feel _________ when I _________ . Student A: Next time, I need _________ . Student B: Next time, I agree to _________ . Student B: Next time, I need _________ . Student A: Next time I agree to _________ . Student A and Student B agree on a handshake, high-five or hug. Giving students this framework empowers them to solve issues other members of the crew. Restorative circles allow students to speak freely and openly while working towards resolving a problem. A circle views of-culture behavior as a teachable moment, separates person from the deed, focuses on fixing the harm done, encourages authentic participation and allows for successful reintegration. Restorative practices take more time and effort than more traditional discipline models. The reason they are worth the extra time and effort are because they create students who are empowered by being a part of the process, enable crew members to restore and build community. Crew leaders help students track their progress in core subject areas such as math and ELA, allowing students to reflect on their own abilities and track their progress and growth in an area, while also providing teacher perspective and feedback. Assessment in the art room has not been my strong suit thus far. While I often assess from my own observations and have students offer feedback to one another, I have struggled to find meaningful ways for students to self-assess and measure their own progress over the course of a unit. I decided to try tracking in the art room with a weaving unity I designed for first grade. Knowing that I wanted students to be able to measure their growth, I would need to provide a gradual progression of skills under the umbrella of weaving. Yardsticks tell us that first graders are work-oriented at this point in their development. They are less concerned with perfecting the outcome of their work and more focused on the process (How ideal! If only things could always be this way.) This provides a great opportunity for creating units in the art room that focus on a single skill, as students are less likely to tire from repeating the same techniques over the course of several projects. No one ever complained when I announced that we would be embarking on *another* weaving piece. Learning the basics with paper weaving. Preparing for loom-weaving with radial weaving. Creating a small loom-woven piece of wearable art. Using needle and thread to create basic embroidery stitches. Overall, the goal was for students to master the “under/over” weaving technique that ensures fibers are binding together in such a way that they won’t come undone from one another. This is one of my favorite media to teach, and I was happy to find that students seemed to enjoy it as much as I did! Tracking student progress through this unit helped me see how much students truly progressed over the course of the projects, some tremendously! At Detroit Prep, we define high quality student work through three lenses: complexity, craftsmanship, and authenticity. For our most recent study on Bird’s Amazing Bodies, my fellow first grade teachers, Ms. Kimberly, Ms. Jackie and I wanted to focus on authenticity in particular. Literacy research shows that much of a students’ ability to write and read past their current level depends on their own investment in the topic and their perception of the work as meaningful or not. In order to push our students to read high-level non-fiction texts and write complex informational paragraphs of their own, we knew that we would have to convince our students that their work had an authentic purpose beyond the four walls of our classrooms. By creating authentic work that connects our studies in crew to local, real-world contexts, we motivate our students to challenge themselves to read and write at higher levels, and we position them as impactful citizens whose work-- even in first grade-- has purpose and meaning beyond the classroom. 1st Grade Crew // Energizing Brain Breaks! School days at Detroit Prep begin at 8:15am and wrap up at 3:45. That’s a jammed pack seven and a half hours of learning and growing our brains! To keep our 1st graders engaged and refreshed for each new subject throughout the day, we do frequent brain breaks. 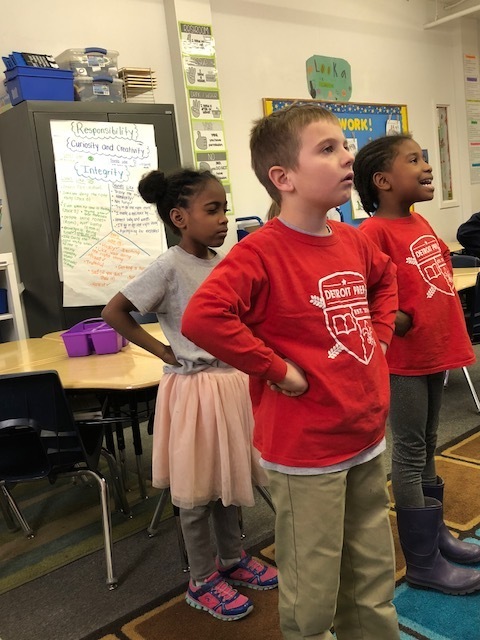 Brain breaks are quick, whole-class activities that give students opportunities to pause, move, and interact in safe, structured ways. They are quick and effective ways of changing the physical and mental state of the learners in our crew. Our crew’s favorite brain break is GoNoodle! GoNoodle is an excellent online resource that gets everyone up and moving while practicing math, spelling, vocab (etc. etc.) in many new and exciting ways. Our crew especially loves the different songs with movement that allow us to skip count to 100 in different ways. As a crew leader, I love the fact that GoNoogle provides many different mindfulness videos as well. These are a great opportunity for us to cool down with yoga poses, breathing exercises and meditation while focusing on the topics of managing stress, enhancing focus, building compassion, and practicing self control! Brain breaks in our crew at times are also a fun read aloud, Simon says, or a coordinated dance break (our crew LOVES to dance). No matter what brain break option we choose, it is apparent that everyone has his or her mood boosted and feels reenergized and ready to learn when we are done. Want to try some of these brain breaks at home over the weekend or on school breaks? GoNoodle is free website that only requires a parent’s email address to sign up. Head over to GoNoodle.com to check it out! 2nd Grade Crew // Field Study! Field Study is an important part of the learning process that makes what students read about in the classroom more authentic to their lives. Second grade has been studying pollination since February and we will continue our learning on this topic through June. This seems like a long time to spend on one topic, right? It could be if students are not excited and engaged in their learning! How do we keep students engaged for so long? Well it’s a combination of reading nonfiction and fictional literature, hands-on play based learning, interviewing experts in the field, and FIELD STUDY! This year second grade visited Leslie Science and Nature Center. Students were introduced to experts in the field and were able to get a close look at the pollinators they have been studying up close! 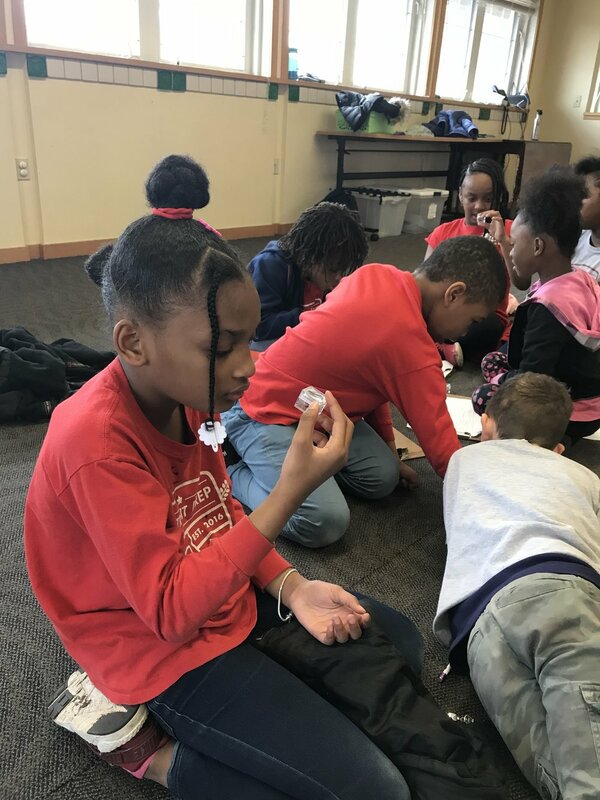 Students went on a nature, worked in groups to discover the life cycle of bugs, and playing a exciting game of pollination tag. When students attend a field study, they attend as researchers. Their job is to take notes and learn as much as they can from their environment and the experts in the field. Students explore with their note-catchers in hand so they don’t miss out on writing down any of the action. Family members are invited and encouraged to join in on the learning fun. Most field study experiences offer an opportunity to families to have fun learning with their child. Our next field study is planned and students are pumped to visit Belle Isle Nature Center to get a closer look at bees and their hive! 1st Grade Crew // Learning From Experts! Here at Detroit Prep, one of our favorite things about following the Expeditionary Learning (EL) model is the incorporation of Field Studies to enhance our learning experiences. In addition to going on many field studies throughout the year, students also learn from experts to deepen their knowledge on our topics of study. Throughout the year, our students at Detroit Prep have learned from experts through virtual experiences like Skype or by having various family members or community experts share their expertise with us. Having experts visit us at school allows students to make connections between our academic work and the authentic world. Recently, our first graders were lucky enough to have a visit from our own amazing social worker, Mr. Anderson’s, father…. Mr. Anderson (Senior)! Mr. Anderson is an avid bird watcher who has taken trips to many places in search of different birds. He was so knowledgeable on bird traits, habitats, their mannerisms, and so much more! Recently Mr. Anderson had traveled to Costa Rica and shared many beautiful pictures and information with our students from his trip. The 1st graders were also all able to browse his bird books and take a look at his different pairs of binoculars to see what it is like to be a real bird watcher. Since our last module of study this school year in 1st grade will focus on how to care for birds, our expert was able to answer countless questions that our very creative and curious students had come up with. Our students have learned so much about birds through research in high quality texts, videos, and a field study to the Belle Isle Nature Center, but we felt so lucky to have had this firsthand experience with Mr. Anderson that enhanced our learning in a whole new way! We are looking forward to learning more and growing with many more expert visits. At Detroit Prep we offer many after-school activities to enrich our students’ experiences and social-emotional learning: guitar, ceramics, dance, soccer and more. Over the past 2 years I have had the privilege of helping coach the DP soccer team! Our team participates in the Detroit PAL League and the US Soccer Foundation’s Soccer For Success Program. This means that we compete in games on Saturdays against other school teams on the East Side of Detroit and follow a certain scope and sequence for teaching soccer as well as healthy living skills. Each day we practice, we have a quick snack after dismissal then walk 3 blocks to a nearby park. (We’re super excited for our new school next year which is a little closer to a safe place to play.) Once we get to the field we run, stretch, check-in about our how our days went and then practice. Soccer practice normally consists of a few drills focusing on foot skills, dribbling or passing then a scrimmage - which is undeniably the team’s favorite parts. We try to emphasize sportsmanship and having fun, along with building strong technique, coordination and skills. We also, when possible, teach about soccer as a global sport which might someday help students make cross-cultural connections. As a teacher, the experience of coaching soccer is really rewarding. It gives me the experience to interact with current and former students (and families) outside of the academic day - to get to know them as people and to see their skills that might not be on display during learning time. For students soccer also seems to be a valuable time. Students playing together really build the sense of crew we aspire to at Detroit Prep and get “real-life” opportunities to practice Habits of Character outside our school community. Creating high quality work, remembering to practice the habits of character, managing peer relationships, transitioning from topic to topic and all the other day to day stressors can be a lot for a young mind to handle. It helps to just take a break. Breaks have been proven to boost energy, increase focus and increase our ability to retain information. At Detroit Prep, there are a few different ways students can appropriately take a break in order to ensure they are bringing their best selves to their learning. Each classroom has a space where students are encouraged to “reset” if they are feeling overstimulated or overwhelmed. Using the reset space in a room is taking a short break while still in the classroom. It allows the student to take a few deep breaths or utilize another coping strategy and rejoin the crew in a short (3-4 minutes) amount of time. Each day after lunch our crews practice mindfulness. This can vary from relaxing to the sounds of the jungle to a guided meditation to silent coloring to watching an aquarium live stream . The goal of mindfulness is to get everyone’s mind in a calm, relaxed, focused place where their best learning will be taking place. While mindfulness is a calm and restful way to take a break, Go Noodle is usually an active and energetic way to take a break. Often times during transitions the whole crew will follow the prompts of different Go Noodle videos. This allows the crew to dance and get all their wiggles out before heading to the next part of the day. See Ms. O’Donnell’s post about Brain Breaks for more information. Each grade is given two recess periods throughout the day. This is a time for active, imaginative play. It is a time to brush up on their soccer skills or participate in a game of freeze tag. It is an exploratory time to allow students a break from structured activities. Use of a sensory tool can be a powerful way to refocus a student. Sensory tools can be thought of much like a pair of glasses. They are a tool that help a student overcome a barrier in the way of their learning. There are many different sensory tools that students have found effective. Bubbling timers (as seen above) are students favorites. Weighted blankets or vests help with feeling overstimulated or overactive. Handheld fidgets are also helpful with feeling overstimulated, anxious and overactive. Even bouncing on a balance can give the student time to recenter and focus. While calm, quiet, restful breaks are useful for some students, other students need active, physical, exercise driven breaks. This can be as simple as doing some jumping jacks to taking a few laps around the gym. Twice a day recess allows us to be active and physical multiple times a day. Students love to be able to walk and play outside, observe nature and just be KIDS! When our team identifies that breaks are an effective intervention for students, we will incorporate the breaks into their behavior plan. Students will have a set time during the day they know they will be able to recenter and reset to bring their best selves to class. Taking a break has been proven to increase students ability to focus, increase energy and retain information. Allowing students the time and space to be able to take breaks is all about them being able to be the best learners possible.